Visitors to Obama’s Timeline are greeted with a smiling photo of the president alongside his cover photo, a graph often shared by Obama supporters that highlights the president’s job creation record. Putting that chart in such a prominent position makes sense, given Obama’s apparent strategy of running for re-election on an “America is back” platform of optimism about the country’s economic recovery…. 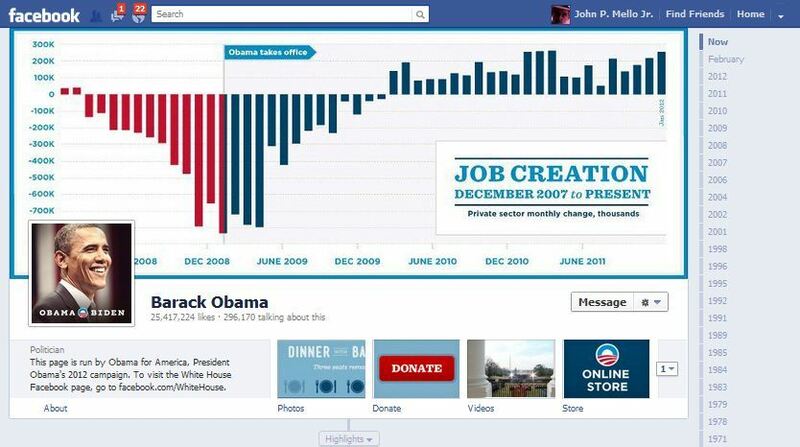 Clearly, Obama’s digital team got the most out of Facebook Timeline’s graphics-friendly format. Tagged 2012, facebook, obama, social media.